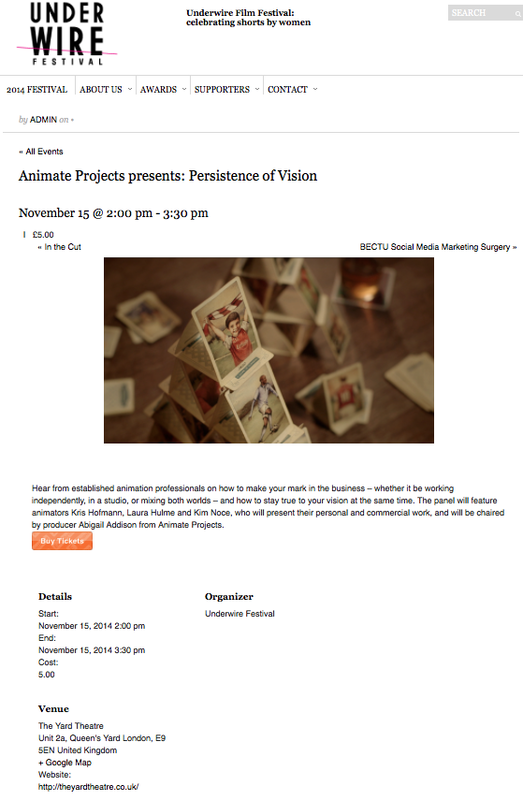 I am delighted I have been invite to present my work at Underwire Festival for the talk hosted by Animate Projects in Persistence of Vision on November 15, 2014 2:00 pm. I will be showing 2 of my films: After and Nest of Stone. I will be sharing the stage with Kris Hofmann & Laura Hulme and their wonderful work! Here a little bit about the event: “Hear from established animation professionals on how to make your mark in the business – whether it be working independently, in a studio, or mixing both worlds – and how to stay true to your vision at the same time. The panel will feature animators Kris Hofmann, Laura Hulme and Kim Noce, who will present their personal and commercial work, and will be chaired by producer Abigail Addison from Animate Projects.